Motivating Words Relating to Volunteering: Where we share what amount to "mini-posters" of inspiring words of wisdom, all in the spirit of volunteering, giving and caring. 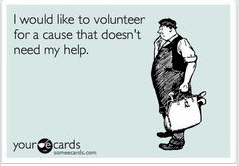 Humor: Cartoons and other funny images dealing with the side of volunteering that makes us laugh. Great Volunteer Recruitment: Volunteer recruitment materials we think are fun, effective, and out-of-the-ordinary. Just Because: Assorted items of interest that are not quite classifiable. Do you have suggestions for what you'd like to see on our Pinterest page? Your ideas are very welcome. And please also let us know about any other Pinterest pages worth sharing. We hope you'll further re-pin and use some of the visuals we find, but please remember to include all credit lines to the original source. Pinterest is wonderful in allowing people to aggregate images they like, but the copyrights are still the property of the original authors, artists and photographers. Great reminders for experienced board members and an easy orientation for new board members. The book provides effective strategies for improving the effectiveness of a board. The board is geared to volunteer service boards but is useful to anyone serving as a board member. A Boards 101 book for trustees new to boards. Includes a chapter on "people raising" by Susan J. Ellis, plus chapters on recruiting board members, fundraising, strategic planning, running meetings, legal issues, and technology. Volume XV, Issue 3 of e-Volunteerism, our international, subscription-based journal for informing and challenging leaders of volunteers,launched on April 15th and will be posting new articles through mid-June. - Irish-Australian colleague DJ Cronin speaks his mind with passion and humor, reflecting on the importance of truly loving the role of leading volunteers. - One of the most powerful things a volunteer can do is see a need and start trying to meet it. In this article we In this article, we introduce Stephanie Myers, an MPA candidate at Villanova University and begin following her efforts to found and grow Mind4Athletes, Inc. (M4A). Look for articles on the economic, social and cultural value of volunteerism to Tasmania, Australia; advocating for volunteers by training paid staff; online resources to engage children as volunteers; a review of a new research report on whether volunteer management is an art or a science; and a look back to a 1954 conference on the interrelation of self-help and social work. In his famous study of employee motivation in the 1950s, Frederick Hertzberg proved that what workers want most is to have attention paid to them by their bosses. In a test putting two groups of factory workers into identical work situations, productivity rose measurably in the group where the plant manager simply walked through the room a few times a day. This has useful implications for the connection between the senior managers of an organization and the volunteers who contribute their time and skills. As simple as it sounds, urge your executives to be visible. Volunteers (and paid staff) feel valued by the presence of a leader, all the more if that person expresses interest in their work. Never underestimate the effect of a warm greeting. Genuine friendliness throughout the year has more lasting impact than any speech at a recognition dinner. Help the exec to learn the names of regularly-scheduled volunteers and use them. If groups of volunteers come on site together, invite the exec to drop by once in a while to say hello - and even better -- occasionally join in with the work for a while (even if this means turning up in jeans and getting dirty hands). It's amazing how much this sort of gesture is appreciated. Senior managers can find ways to ask volunteers for their opinions or give input about something. Department heads, for example, might circulate brief surveys along with a note explaining the importance of volunteers' perspective on such matters, since they represent the community. Monthly, invite a random group of perhaps six volunteers to meet with key managers for morning coffee for 30 minutes, during which the organization's leaders learn what volunteers are observing in the facility. Word will spread that people at the top care what volunteers think, and the perspective gained will be eye-opening. Top leaders can prevent "silo" thinking by periodically inviting volunteer services staff to meet with the staff of the public relations, marketing, human resources, and development departments to exchange ideas, mesh projects when possible, and maximize itineraries. When various staff go out into the community, are they all carrying consistent messages that share the range of ways the public can support the organization? It's up to the executive to facilitate such cross-department interaction. Volunteers will also be proud to be agency ambassadors, if requested. Suggest that your executive send a memo explaining a new service or project, attaching information about it or instructing how to learn more, and then ask volunteers to "talk up" the news to family, friends, co-workers, and others in the community. Money talks. Even when discussing volunteers. Volunteers are happy to give their time without remuneration and don't want expensive gifts. But they are quite aware of where they sit in the pecking order of budgeting. For example, volunteers notice if the volunteer office has cast-off furniture or insufficient equipment, while other offices seem to be favored. It is commonly accepted that reimbursing volunteers for out-of-pocket expenses is a good thing. If you haven't been able to afford this up to now, maybe it's time to find a donor or hold a small fundraiser to get the cash. That's what top management would do if the paid staff really needed something. The good news is that it doesn't take much money to show volunteers you care. A survey of volunteers in a large hospital in Australia revealed that, out of a list of more than twenty different thank-you gestures, the one that got the highest approval was a free refill on coffee in the cafeteria! It was the thought, the gesture of respect, that mattered. Similarly, it is possible to cut out the expensive recognition luncheon, substitute a make-your-own-ice-cream-sundae party (or a cocktail party, if you prefer elegance), invite more people, and have lots more fun. Convey your appreciation with a genuine celebration, in which the interaction with others is more important than the menu. Ask lots of people to make brief, personal remarks about organization successes-members of staff, possibly clients, and certainly volunteers themselves. When it's the top executive's turn to speak, makes sure it's from material s/he wrote personally. Volunteer radar will immediately detect the CEO who is reading a speech someone else prepared.